Home » Shelf or Shelve – What’s the Difference? The words shelf and shelve are confusing. They are different parts of speech, but many English users are incautious, and use them interchangeably. To make matters worse, the word shelves can be both a noun and a verb, and it is related to both shelf and shelve. What’s a writer to do? Since you’ve made it this far, you might as well continue reading to learn more about these confusing words. What is the Difference Between Shelf and Shelve? In this post, I will compare shelve vs. shelf and use each word in a few example sentences. You will be able to see the words in the context of complete sentences. Then, I will talk about a mnemonic device that allows you to choose shelve or shelf correctly every time. What does shelf mean? Shelf is a noun. It is a horizontal surface upon which things can be placed. The plural form of shelf is shelves; multiple shelves might be collectively called shelving. A bookshelf is a structure that has several shelves arranged vertically to maximize storage space in a small footprint. A bathroom shelf is a shelf in a bathroom. If you look on the third shelf in the linen closet, you will find clean towels and a set of fresh sheets for the guest room. Grandma placed her favorite trinkets on a high shelf in the living room, where hyperactive grandchildren could not reach them. What does shelve mean? The word shelve is a verb. It means to put things on a shelf, where shelf is the noun discussed above. It sometimes also means to decide not to move forward with something. “I think we are going to shelve this idea,” said the chairman after none of the other board members could come to an agreement. “Julia can shelve the new inventory while Mark sweeps the floors,” said the manager of the grocery store. Shelve cannot be used as a singular noun. Some English speakers might use shelve in place of shelf in informal conversation, but this usage is not considered correct. Misusing shelve for shelf is probably a backformation from the plural shelves. Since many nouns become plural by adding the suffix -s, some speakers might mistakenly think shelve is the same way. The confusion could also arise from the word shelves, which can be both a noun and the third person singular conjugation of the verb shelve. Shelf is a noun and shelve is a verb. Even though the plural form of shelf is shelves, shelve is never a singular noun. What’s an easy way to remember shelf vs. shelve? Since shelve and verb both contain the letter V, remembering that shelve is a verb should be a relatively simple proposition. Is it shelf or shelve? A shelf is a raised, horizontal surface used for storing things. The word shelve is a verb that means to decide not to move forward with something or to put things on a shelf. The two words are never interchangeable, although shelves is both the plural form of shelf and a possible conjugation of shelve. Use shelf only as a noun. Use shelve only as a verb. 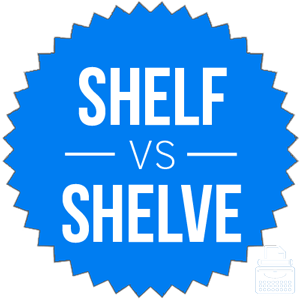 1 What is the Difference Between Shelf and Shelve? Stayed or Staid – What’s the Difference?